Lyme disease is a serious infection transmitted by deer ticks, which can cause many complications, such as problems with the joints, skin, nervous system and heart. What is particularly difficult in this disease is that some of these consequences we see only after several years of tick bites, which hinders the further course of treatment. Prevention is the most important and powerful immunity, if it comes to tick bites. The middle of the spring and throughout the year is an ideal time for excursions in nature - some enjoy with family, others with friends, and there are those who spread a blanket on the grass under a tree, and in the company of a good book spend a few hours away from the city. As much as the stay in the fresh air is useful and recommended, we should not forget the ticks, lurking from early spring to late fall. Exactly they transmit Lyme disease, or borreliosis. What are the symptoms of Lyme disease in humans? It is an infection caused by a spiral bacteria borrelia burgdorferi, which is usually infects deer ticks who comes into contact with other animals (usually mice or deer). Lyme disease in children most commonly affects children between the ages of 5 years up to teenagers 14 years of age and in adults usually occurs between 40 and 50 years, but it can occur at any age. Tick ​​bite is generally imperceptible, because this parasite its saliva contains a natural aesthetic. 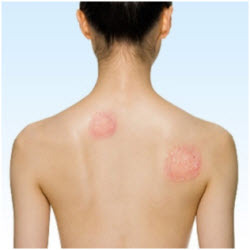 The first sign of Lyme disease is a red rash at the site of the bite, which does not itch and does not hurt, but is spread over the skin and it can occur on many places. They can be accompanied by symptoms very similar to seasonal flu: headache, fatigue, fever and then these signs are associated with respiratory seasonal infections - especially in summer, and it is necessary to do more searches. The next phase of the disease is swelling and pain in the joints, especially the knees. Dizziness and chest pain can occur. There are also numerous neurological symptoms such as stiff neck and severe headache (which at first glance suggests meningitis), temporary paralysis of the muscles in the face, pain and weakness in the limbs and poor coordination of movements. These symptoms of Lyme disease usually occur several weeks after infection, and last from several days to several weeks. Lyme disease in humans can affect the optic nerve, when it comes to its weakening, also not spared is our heart muscle. There is a long list of symptoms and manifestations of the disease, some people may show more or less indicators of the disease. What is particularly interesting is the fact that the bug does not have to bite you to infect you - if your skin or mucous membranes is injured, it is sufficient that the parasite lights come in contact with them, and the bacteria will find a way to enter your organism, carrying the infection. In addition, if you remove the parasite from the body immediately after you return from the trip, the chances to of infection are much smaller, because Lyme disease is mainly transmitted by infected deer ticks, which can spend 36-48 hours on the skin, looking for a pleasant place for a bite. It is therefore very important that immediately after arriving home you take a shower and do a detailed review of your body, especially the parts where the skin is thinnest: the inside of the knees, behind the ears, the neck, underarms, stomach, and in the groin. You should look at your hair and scalp. Clothes should be wash, and if you have brought with you a pet, be sure and check it, because Lyme disease in dogs is especially dangerous. If notice a tick on your skin, by no means do not remove it by hand. Do not try not to burn it (eg, with a cigarette), and use of alcohol or acetone is strictly prohibited, because the fluid can stimulate parasites that are excreted in the blood. The tick is removed with tweezers, but you have to be careful to remove the body and head. However, it would be best to leave it to an expert so as the head of the tick does not remain, then you have done literally nothing. In some people (10-20 percent of patients, the symptoms of Lyme disease occur after the treatment, which usually lasts from two to four weeks. Chronic fatigue does not stop, and there are frequent pains in joints and muscles, which usually last up to six months after treatment. Although this phenomenon is known as chronic Lyme disease, doctors emphasize that this is a syndrome that occurs after treatment (Post-Treatment Lyme Disease Syndrome). Experts believe that the symptoms of Lyme disease lasts even after healing because certain tissues in the body get damaged and the immune system needs time to fully recover. If you have been diagnosed with Lyme disease, treatment by your doctor prescribed should be combined with proper nutrition. First of all, forget the sugar. In fact, if you consume antibiotics, they kill both bad and good bacteria. On the other hand, given the fact that harmful bacteria feed on sugar, it can reduce the effects of drugs. It is also required to avoid cow's milk and gluten-rich foods (white bread, but also many sweets and processed foods) and starch (rice, potatoes, sweets). On the other hand, include foods that are rich in protein (meat, fish, eggs), and it is especially recommended to consume yogurt, which acts as a probiotic. Also, eat a salad of green leafy vegetables and fruits rich in fibre (apples, pears, and strawberries, avocado). Food spice turmeric natural antibiotics and oregano, and you can add an occasional pinch of ground chili peppers. Lyme disease is in some cases very difficult to diagnose. The blood is mandatory for an analysis, except that in the first week tests may be negative to bacterial infection, even if it is present in the organism. A particular problem is the fact that symptoms of Lyme disease can be misleading, because it suggests other diseases. Moreover, the characteristic red rash is not present at 20 percent of the people who are bitten by a tick, which is why doctors must insist on a detailed description of all problems, no matter how innocent it may sound. If detected in the first stage, Lyme disease in humans is very easily treated with oral antibiotics, while later stages require more complex therapy, which includes anti-inflammatory medication. An additional problem is the ability of bacteria to avoid the operation of certain antibiotics, changing its shape. What are the consequences and complications if the disease is not diagnosed in time? Lyme borreliosis in humans causes a variety of complications with the skin, joints, heart and nervous system (some of the complications occur even several years after the tick bite). Finally, Lyme disease in humans in late stages can cause serious problems - in 60 percent of patients who have not visited the doctor in time developed chronic arthritis. Garlic is true as the most effective natural cure for Lyme disease because it has antibacterial properties, and in addition it is excellent in cleaning the blood, which is important if the bite of ticks has already occurred. It is also used preventively - studies have shown that the chances of becoming infected with Lyme disease are much lower if you eat this vegetable. It can be included in the diet as a supplement and can be combined with lemon juice, and other herbs such as milk thistle (Milk thistle), wild mint and ginseng. What herbs are used in the treatment of Lyme disease depends on the symptoms displayed, but it should be plants that strengthen the immune system and act against inflammation and pain. Echinacea and ginseng apply to plants that strengthen the immune system, stimulating immune cells of the body to fight bacteria. These natural remedies can alleviate the primary infection, but also prevent potential future problems caused by Lyme disease in humans. Echinacea is best taken as a tincture (10-30 drops diluted in a glass of water, three times a day), while the consumption of ginseng is recommended in the form of a tea (one cup is enough per day - a teaspoon of dried leaf ginseng is pour with a cup of boiling water). However, none of these plants should not be taken by pregnant women and those suffering from autoimmune diseases. Nettle, liquorice, clover, sage and rosemary also alleviate symptoms of Lyme disease (tea prepared by the scoop of leaves, roots or flowers of plants are poured with 2 dl of boiling water). Some herbalists suggest the tea mixture of sorrel, burdock, elm and rhubarb. In addition to teas and tinctures, in the treatment of Lyme disease it is recommended the use essential oils. Oil incense alleviates joint pain, and headaches, and the best are lavender and mint oil. On the other hand, essential oil of scented plants ylang-ylang will calm the nervous system and alleviate the arrhythmia if it occurs. About 25 grams of dry chopped ginger root is poured with a litre of water. When it boils, lower the temperature and cook for 10-15 minutes. Strain and add 2-pressed lemon. Sweeten with honey and drink one cup of tea before each meal. We hope you find out what is Lyme disease and how the disease manifests itself, how it is diagnosed and treated by different methods and therapies. Certainly be sure to see your doctor, especially if you have had a tick bite.